It’s fair to say that tapas has taken over London during the past few years, be it in the traditional sense of the word, or as shorthand to describe the sharing plates that have become the ubiquitous offering of almost every trendy restaurant opening in the past half decade. It’s a trend – along with one of no reservations – that annoys many, but personally, as a glutton, I enjoy it. I get to try more things, even if my bank manager doesn’t appreciate the bills it can lead to. 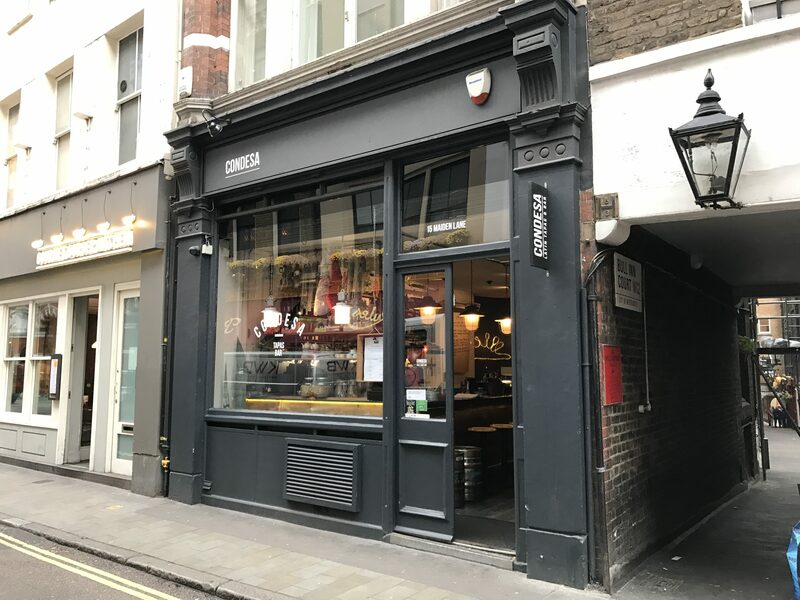 Condesa on Maiden Lane, Covent Garden, has spent the past four years quietly offering something different. It may not be the most well known of tapas bars – indeed a Google search for reviews only provided results from the general public on sites like TripAdvisor – nothing from mainstream newspapers and the like – but they do have a following, and it’s often busy in the evenings. More importantly, what they are serving up is a breath of fresh air. Everything about Condesa, named after both a chic bohemian district of Mexico City and the Spanish for countess, reminds one of small tapas bars in Madrid, Barcelona or San Sebastian. On entering, one is confronted by a reassuringly small space, hams hanging in the window and tiled walls. Like all good tapas bars, the space is dominated by a wide bar running into the room from the doorway, laden with Iberico hams ready to be sliced, cutlery for customers sitting at it or the high tables around the edge of the room, and a little shelving unit of the type that many tapas bars in Spain use to display the pincho they serve. All of this is set in front of a wall of bottles and a large roll of brown packing paper that has the daily specials listed on it. Tucked away high on the top shelf you’ll also spot a single blue Día de Muertos skull, the only hint in the décor that this isn’t a purely Spanish tapas bar. Of course the first thing to do in a tapas bar is to order a drink, and they have a small but perfectly formed offering of mostly Spanish wines and, best of all, sherry, the traditional drink to have with tapas, yet rarely offered in the UK. But if sherry isn’t your thing, then there is a small cocktail list and the best gin and tonic list I have seen at any restaurant or bar. What makes this gin and tonic menu so good isn’t the number of options – there are only seven – but the fact that the 50ml shot of gin you choose is paired with the right tonic for it and, more importantly, the correct garnish as this more than anything allows the flavour of the gin to sing. I went for the Monkey 47 with Fentiman’s19:05 herbal tonic and a blueberry garnish, a perfect combination that brings out the fruity notes of the gin and balances so well with the herbal tonic. It’s a totally different drink to the standard Monkey 47 with Schweppes or Fever Tree and a slice of lime or lemon. People underestimate the need for the right garnish but they should consider it more. Why spend the extra money on a well crafted small batch gin if you’re not going to serve it properly but rather disguise and close off the flavour and quality it has – and which you’ve paid so much extra for? The menu is equally select – again Spain calling – covering all the tapas food groups, cured hams, cheese, meat, fish and nonmeat, and then, of course, there are the specials; in each case there’s only three to five choices. The charming waitress let us know that between two we’d need four or five plates, so we ordered the octopus ceviche from the main menu and, from the specials, the hickory smoked beetroot carpaccio with cured goats cheese and honey, the duck confit with black poblano sauce, shisho leaf, plantain and passion fruit on blue corn, and the smoked solomillo (Iberian tenderloin) with manchego and wasabi mayo. First to arrive was the beetroot and goats cheese. 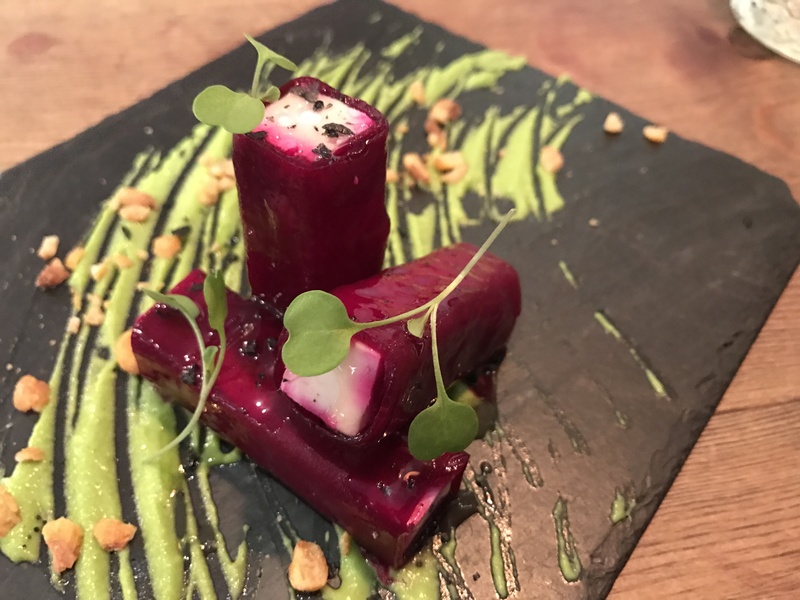 Instead of the usual small plate of sliced beetroot with crumbled soft goats cheese, what came were three batons of goats cheese wrapped in beetroot on a green splodge. The great surprise of the dish was the extent to which the hickory smoke came through, playing with the harder than normal goats cheese (a result of its curing) and the honey. Just as one dish is almost finished, the next is brought over from behind the bar where it had been made or finished off, another lovely touch that reminded one of true tapas bars and the efficient systems they have. The octopus ceviche was the most basic of the four dishes – diced octopus, cucumber and tomato – but did not escape the uplift and reinterpretation that other dishes have at Condesa. Drizzled with habanero oil and served on a crispy corn tortilla, the dish screamed modern Mexican. 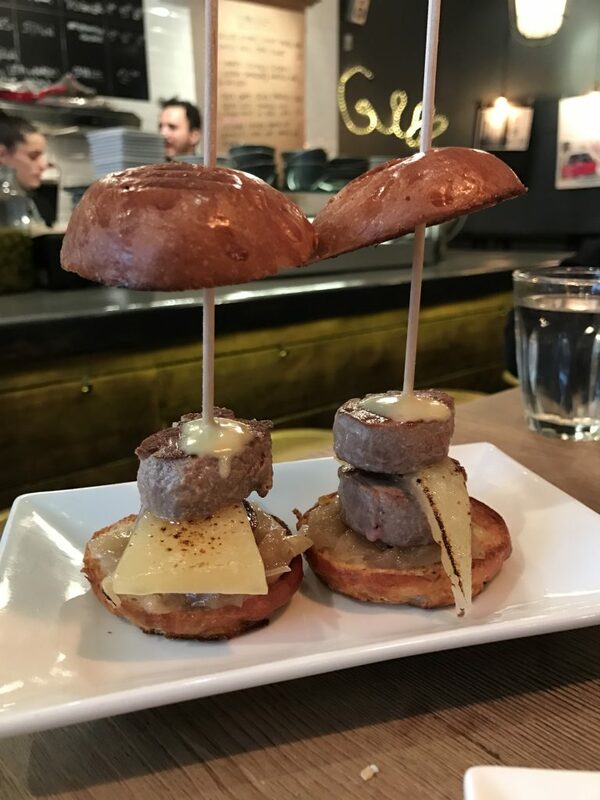 The mini Iberian tenderloin burgers were little mouthfuls of smoky succulent richness, thanks to the thick, semi-melted wedge of manchego, while sweetness came from the bun and caramelised onions. The wasabi mayo I think had been replaced by a truffle mayo, given one was getting earthiness rather than fiery heat, but I wasn’t complaining as it rounded off the burger perfectly. The tenderloin and the duck confit were the stars of the show. The moment I saw the exquisite plating for the duck I knew we were in for something special. The duck was beautifully tender, with a black bean sauce giving it a slight sweetness that reminded one of Chinese plum sauce. The sweetness could have been too much, but it was skilfully balanced out by the passion fruit and plantain, while the shisho leaf and flowers added a ‘fresh’ natural texture against the crispy blue corn base. By way of dessert Condesa was serving just one option, an almond tart. Now I’m not a huge fan of almond tarts as – for obvious reasons – they tend to taste a lot like the devil’s paste – marzipan. (In case you can’t tell, I don’t like marzipan.) Despite my aversion to such tarts, we did give it a go, and I’m glad we did. 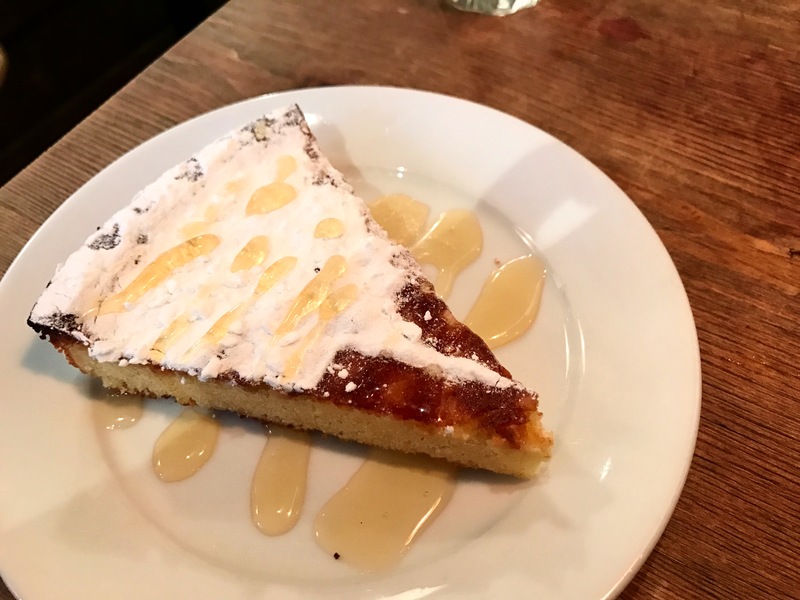 It was by far the best almond tart I can remember trying, at once sweet, sticky and light. Condesa is everything a modern tapas bar should be; at the simplest level the meats and cheese are of the highest quality, while the hot dishes are creative. This, of course, is what every top tapas restaurant in London is like. But Condesa stands out as a welcome alternative, especially in Covent Garden. 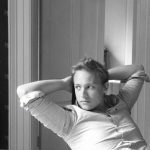 It has worked hard and thought carefully about how to bring a more authentic small Spanish tapas bar feel to London. 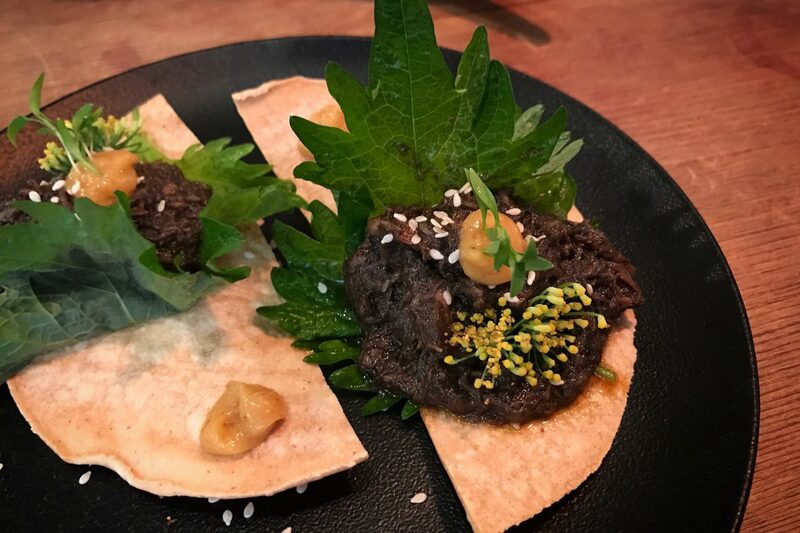 Best of all, by looking to Mexico for inspiration and ingredients, they have found a way to serve tapas that is at once traditional yet different from anything being offered elsewhere. They have reinvented and rejuvenated the form.